There are a couple of articles on 'No Awareness' or 'Beyond Awareness'. It must be emphasized that this does not mean the non-existence of awareness, or the denial of awareness or luminosity. there is no deny of clarity or luminosity, it is the singling out of luminosity that is the problem. Because of inherent thought, we understand 靈妙覺體 [spiritual and marvellous body of awareness] as standalone, singled out from DO (Dependent Origination) or otherwise we r understanding it as "interaction". Or if conceptuality is a problem then non-conceptuality must b the solution. It is addressing this way of thinking, of understanding is a misperception. It is not to imply that there is no clarity...but what is clarity when it is not understood using this flawed mode of perception. In Buddhism, it is not how. It's always under what conditions such phenomena arises. So when this cause & condition persists, the phenomena will arise. First is to bring out the point to ask why appearances "arises" in Awareness is the same as asking why is awareness aware in awareness teaching. Why so? For the convention we call awareness is only ever appearances. As I hv given above. If Buddha ask ananda, where is mind...if mind is not outside, not inside, not in the middle, not within the body...then is he ananda going to think that Buddha doesn't dare to affirm where is the mind? Then ananda will nvr know the meaning of DO. And the problem of how inherent thought blinds one from seeing and having direct experiential insight of what is meant by freedom from extreme. 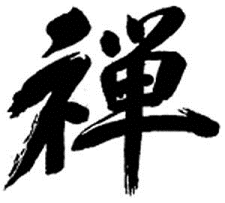 When u present to 不思, u must not deny 觉 (awareness). But emphasized how 覺 (awareness) is effortlessly and marvelously manifests without the slightest sense of referencing and point of centricity and duality and subsuming ...be it here, now, in, out...this can only come from realization of anatta, DO and emptiness so that the spontaneity of 相 (appearance) is realized to one's radiance clarity. (11:42 PM) Thusness: i have always said it is not the denial of eternal witness. (11:42 PM) Thusness: but what exactly is that eternal witness? (11:42 PM) Thusness: it is the real understanding of eternal witness. (11:43 PM) Thusness: without the 'seeing' and 'veil' of momentum, of reacting to propensities. (11:43 PM) Thusness: however when one quote what buddha said, does he understand first of all. (11:43 PM) Thusness: is he seeing eternal witness as in the advaita? (11:44 PM) Thusness: or is he seeing free from propensities. (11:44 PM) Thusness: so there is no point quoting if it is not seen. (11:44 PM) Thusness: otherwise it is just saying the atman view again. (11:44 PM) Thusness: so u should be very clear by now...and not to be confused. (11:45 PM) Thusness: what have i told u? (11:45 PM) Thusness: u have also written in ur blog. (11:45 PM) Thusness: what is eternal witness? (11:45 PM) Thusness: does one see with the propensities and what is really it? (11:45 PM) Thusness: that is more important. (11:46 PM) Thusness: i have said so many times that the experience is correct but the understanding is wrong. (11:46 PM) Thusness: wrong view. (11:46 PM) Thusness: and how perception influence experience and wrong understanding. (11:47 PM) Thusness: be very very clear and know with wisdom so that u will know what is right and wrong view. (11:47 PM) Thusness: otherwise u will be reading this and get confused with that. (6:11 PM) Thusness: the way u explained as if 'there is no Awareness'. (6:11 PM) Thusness: People at times mistaken what u r trying to convey.but to correctly understand this 'jue' so that it can be experienced from all moments effortlessly. (1:01 PM) Thusness: But when a practitioner heard that it is not 'IT', they immediately began to worry because it is their most precious state. (1:01 PM) Thusness: All the phases written is about this 'Jue' or Awareness. (1:01 PM) Thusness: However what Awareness really is isn't correctly experienced. (1:01 PM) Thusness: Because it isn't correctly experienced, we say that 'Awareness that u try to keep' does not exist in such a way. (1:01 PM) Thusness: It does not mean there is no Awareness. (12:07 AM) Thusness: get it? (9:56 PM) Thusness: those quotes weren't really well translated in my opinion. (9:57 PM) Thusness: what needs be understood is 'No I' is not to deny Witnessing consciousness. (9:59 PM) Thusness: It is just for the purpose of 'de-constructing' the mental constructs. (10:01 PM) Thusness: when u hear sound, u cannot deny it...can u? (10:01 PM) Thusness: so what r u denying? (10:02 PM) Thusness: when u experience the Witness as u described in ur thread 'certainty of being', how can u deny this realization? (10:03 PM) Thusness: so what is does 'no I' and 'no phenomena' mean? (10:03 PM) AEN: like u said its only mental constructs that are false... but consciousness cant be denied ? (11:16 PM) Thusness: can u deny that certainty of being? how could u deny ur very own existence? (11:20 PM) Thusness: what is luminosity. (11:21 PM) Thusness: in later phase, when u experience non-dual, there is still this tendency to focus on a background... and that will prevent ur progress into the direct insight into the TATA as described in the tata article. (11:22 PM) Thusness: and there are still different degree of intensity even u realized to that level. (11:23 PM) AEN: non dual? (10:47 PM) Thusness: so that u can progress further and realize our empty nature. (10:50 PM) Thusness: non-conceptuality, clarity, luminosity, transparency, openness, spaciousness, thoughtlessness, non-locality...all these descriptions become quite meaningless. just whether one understand its emptiness nature or not. since when there is no witnessing? (2:58 PM) Thusness: There is no problem being the witness, the problem is only wrong understanding of what witness is. (2:58 PM) Thusness: That is seeing duality in Witnessing. (2:58 PM) Thusness: or seeing 'Self' and other, subject-object division. That is the problem. (2:59 PM) Thusness: U can call it Witnessing or Awareness, there must be no sense of self. (11:26 PM) Thusness: first stage of insight of the "I AM"
"So you have these two extremes - both of which I find pretty annoying (laughs) - and uhm, not that they are not making interesting points that counterbalance each other. And then, from an experiential point of view, the whole field seems to be happening on its own in a luminous way, the intelligence or awareness seems to be intrinsic in the phenomena, the phenomena do appear to be totally transient, totally ephemeral. So I would reject from an experiential point of view, something in the harshness of the dogma of the rigid no-selfists that can't recognise the intrinsic nature of awareness that is the field. If that makes sense. Cos they tend to feel there's something about that's sort of (cut off?)..." Interviewer: "And not only awareness..."
Daniel: "Intelligence. Right, and I also reject from an experiential point of view the people who would make this permanent, something separate from, something different from just the manifestation itself. I don't like the permanence aspect because from a Buddhist technical point of view I do not find anything that stands up as permanent in experience. I find that quality always there *while there is experience. * Because it's something in the nature of experience. But it's not quite the same thing as permanence, if that makes sense. So while there is experience, there is experience. So that means there is awareness, from a certain point of view, manifestation - awareness being intrinsically the same thing, intrinsic to each other. So while there is experience, I would claim that element (awareness) is there - it has to be for there to be experience. And I would claim that the system seems to function very lawfully and it's very easy to feel that there's a sort of intelligence, ok, cool... ...the feeling of profundity, the feeling of miraculousness, the wondrous component. So as the Tibetans would say, amazing! It all happens by itself! So, there is intrinsically amazing about this. It's very refreshingly amazing that the thing happens, and that things cognize themselves or are aware where they are, manifestation is truly amazing and tuning into that amazingness has something valuable about it from a pragmatic point of view." 5/24/2012 8:07 PM: John: Do u feel everything as Self now? 5/24/2012 8:17 PM: John: How so? If it is not correct insights and practice, how is it possible for such complete and total experience of effortless and uncontrieved Presence be possible? 5/24/2012 8:22 PM: John: Indeed and this is being authenticated by the immediate moment of experience. How could there be doubt abt it. The last trace of Presence must be released with seeing through the emptiness nature of whatever arises. 5/24/2012 8:22 PM: Soh Wei Yu: I see..
5/24/2012 8:25 PM: John: After maturing and integrating ur insights into practice, there must be no effort and action.... The entire whole is doing the work and arises as this vivid moment of shimmering appearance, this has always been what we always called Presence. Btw, r experience (appearances), immensely crystal, brilliance and sharp..without any background...so crystal that a sense of transparency arise? "Has awareness stood out? There is no concentration needed. When six entries and exits are pure and primordial, the unconditioned stands shining, relaxed and uncontrived, luminous yet empty. The purpose of going through the 7 phases of perception shift is for this... Whatever arises is free and uncontrived, that is the supreme path. Whatever arises has never left their nirvanic state... ... your current mode of practice [after those experiential insights] should be as direct and uncontrived as possible. When you see nothing behind and magical appearances are too empty, awareness is naturally lucid and free. Views and all elaborations dissolved, mind-body forgotten... just unobstructed awareness. Awareness natural and uncontrived is supreme goal. Relax and do nothing, Open and boundless, Spontaneous and free, Whatever arises is fine and liberated, This is the supreme path. Top/bottom, inside/outside, Always without center and empty (2-fold emptiness), Then view is fully actualized and all experiences are great liberation." His view is more substantial view. Buddhism does not deny luminous clarity, in fact it is to hv total, uncontrieved, direct non-referential of clarity in all moments...therefore no-self apart from manifestation. Otherwise one is only holding ghost images. So understanding a spirit traveling in the 6 realms is diff from recognizing these realms are nothing more than one's radiance clarity. Also see: What is Total Exertion? Shinshu Roberts is a Dharma Heir of Sojun Mel Weitsman, abbot of Berkeley Zen Center and in the lineage of Shunryu Suzuki Roshi. 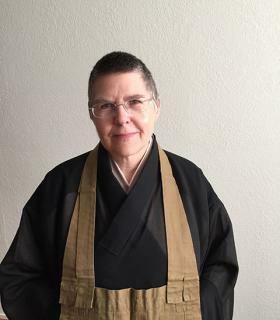 She received her priest training at San Francisco Zen Center and from the North American branch of the Japanese Soto School. She has been appointed Kokusaifukyoshi (International Dharma Teacher) by the Shumucho (Japanese Soto Administration). She co-founded Ocean Gate Zen Center in Capitola, CA with her spouse Jaku Kinst. Dynamic movement can also be understood as a moment abiding as impermanence. Tanahashi translates this section as "actualized by ascending and descending of the time-being at each moment," suggesting a quality of staying put yet dynamically moving. If you are a dancer, you respond to sound and rhythm with your body. Yet each dance has its own demands or particularity. If you are a ballerina, you have a certain set of forms defining the style of how you will dance, yet within these parameters, your options of expression are innumerable. As you dance, that moment also holds the moment of the music's composer, the moment of composition, the history and culture of the music, the creativity of the choreographer, endlessly naming and including everything in the universe. There is also the nondual, total inclusivity of each moment, as the dance dances the dance - no subject and no object. At the same time, there is just the unique, independent, exclusive moment of the individual dancer dancing. Both are happening together, both depend upon the other for being-time's expression. This is the moment's constancy in the midst of dynamic expression. Abiding in the moment is the right-here-and-now of our experience: it is enduring suchness. This suchness is the dynamic interpenetrating connection with all of reality. You may have a feeling that this moment is tranquil and quiescent, separate and complete. Yet, this moment is still interacting with all of reality. We're not usually aware of the universality of the moment, but that does not negate its expression. This moving up and down can be understood as a kind of deep penetration of a particular occurrence of our being-time. At the same time, it is all being-time. The universal quality is the connective glue of all dharma positions as they simultaneously actualize being-time. Because each moment is interpenetrating being-time and also independent in and of itself, we get a sense of impermanence expressed. Continuing the paragraph, Dogen writes, "This time realizes the entire world by being a creature with three heads and eight arms, and realizes the entire world by being a sixteen-foot golden body." Dogen is reiterating that a particular dharma position's independent nature might be perceived as a creature with three heads and eight arms or a sixteen-foot golden body..."
In the United States, we often hear about mindfulness associated with Buddhism. A popular definition of mindfulness is a kind of complete attention on an activity and its object. For instance as we are washing dishes, we might be saying to ourselves, "I am washing a plate," and focusing our thoughts on the feeling of the activity itself. We might slow down, follow our breath, and put all our focus on the sensation of the task as an object of our attention. This would not be how Dogen would approach the practice of deep investigation or exhaustive penetration. He might be describe the activity of washing dishes as washing washes washing, thereby removing the subject-object relationship. Mindfulness may be a dharma gate to intimacy, but it is not the Zen practice of exhaustively penetrating the totality of one's experience. In the true intimacy of complete engagement there is no labeling of self or other that comes from paying attention to something outside the self. When engaging in work practice, a Soto Zen student is interacting with the totality of all the elements arising within the context of that activity. This means that one makes effort to fulfill the task in such a way that one is respectful of the tools used, the context of the work, the instructions of the work leader, the time allotted for the task, and working in unison with others. The purpose of our effort is to complete the job through our total exertion and practice with the task itself. It is not to be mindful of the activity as an object of our attention. When we are able to engage in work this way, we drop our own agenda and fully engage with the complete activity of cleaning and community. Included in this intimate total immersion in the being-time of a particular moment is the simultaneous arising of all being-time. This nondualism is not separate from the relative or everyday. Washing dishes is not special. By entering the world of washing dishes, we enter the whole world, which is our world, by jumping in with wholehearted effort. "Real form is all dharmas. All dharmas are forms as they are, natures as they are, body as it is, the mind as it is, the world as it is, clouds and rain as they are, waking, standing, sitting, and lying down, as they are; sorrow and joy, movement and stillness, as they are; a staff and a whisk, as they are; a twirling flower and a smiling face, as they are; succession of the Dharma and affirmation, as they are; learning in practice and pursuing the truth, as they are; the constancy of pines and the integrity of bamboos, as they are." This perfect realization is all dharmas totally expressing their true nature. We are "buddhas alone, together with buddhas." We remember the true state of ourselves and all being(s). The integrated self is therefore not separate from all being-time. For this reason, Dogen writes earlier in "Uji," "to set the self out in array is to make the world," which is the singular expression of "entirely worldling the entire world with the whole world."" When we don't force a moment of practice into a preconceived idea, we find that we may not recognize practice-realization when it arises. Dogen writes in "Kajo" (Everyday Activity) that the Zen masters manifests their understanding while drinking tea and eating rice. Understanding is manifest in the everyday activities in which we all engage. When we are trapped in the supposition that realization must have some special quality, we miss the fact. We tell ourselves that our current life is not special enough; therefore, it could not be a life realized. If we follow this way of thinking, when we read that Zen masters express realization while drinking tea and eating rice, we believe that the being-time of their drinking and eating must be special and outside daily life. How could our eating and drinking be in the same league as that of a Zen master? Zen masters sit in grass huts, stillness radiating from the holy mountains that surround them, accompanied by the sound of a creek. Their tea is as green as the frog leaping into a nearby pool and their rice is infused with their enlightened nature. Surely they do not put their pants on one leg at a time! From this erroneous view, we extrapolate that Zen masters are enlightened outside of the interactive arising of all dharmas, so-called daily life. Actually, Zen masters are Zen masters because they do not get caught in some idea about reality. Rather, they respond to the arising dharmas in such a way that they include the totality of each moment, thereby enacting realization. This is a fluid, continuous, impermanent response state. When we respond with an idea about how we should be, we are forcing the moment. We get caught in thinking Zen is special and outside daily life. From this view, how could we understand our life as realized response? How can we possibly understand that when nothing special is happening, our life, just as it is, can resonate with realization? We don't recognize the skillful things we do as practice-actualization. Yet, each moment that we are able to fully participate in the totality of that moment is realized response. Enlightenment is not a fixed state residing within an individual. Rather we engage in enlightened behavior, at this time, responding in concord with the continuous practice of all beings worlding the world. Do not underestimate your realization by negating it, and don't make it more than it is by concretizing it. Just pay attention to the business at hand. Zazen, going to the bathroom, chanting, going to work, or any other activity you can think of is an opportunity to fully inhabit our lives within the context of all life. Most of the time we don't even notice when we are fully occupying a moment." Chin Ten Ton Ryan Ten Ton. patriarchs from rightful successor to rightful successor. whole east, west, south and north. The wind-bell exemplifies passing in and through this moment's moment. The particular moment of the wind-bell's sounding is the culmination of the passage of wind, metal, sound, the bell, and the effort of all being-time throughout time and space. It is not just the direct cause and effect of wind moving the clapper. A wind-bell hangs in space. This bell exists as an independent moment of being-time. It does not try to control the direction of the wind. The wind-bell does not perceive the wind as sequential. The wind itself is just the is-ness of the being-time of passage, it has no particular agenda called "moving the wind-bell's clapper." This wind's arising and this bell's being-time are mutually penetrating and mutually engaged in their activity. There is the passage of the bell and the passage of the wind. The bell is pure response. The wind is pure response. The east is response. The west is response, south and north are response. Nothing is left out. The wind-bell's song is the mutual penetration of everything seen and unseen. All passage is just this, and yet there is the moment of the wind-bell's sounding. This can be said of each element mentioned in the poem. All together, affirming, rings out the voice of "Chin Ten Ton Ryan Chin Ten Ton." Because the wind-bell's voice is also the voice of all being-time, Dogen writes this is the affirmation of wisdom transmitting passage from "rightful successor to rightful successor." It is the wisdom of the whole body of universal being-time. This is also true for spring's passage. It is the wisdom of the particularity of a dharma that is both the independent self and the self of no-self of that dharma. It is the wisdom of everyday life called spring's-passage-being-time." "...In the main story, a young man was a student of Master Gutei. This student didn't seem to realize what he was learning or practicing. Dogen comments, "a boy who attended Master Gutei (Judi), without noticing when he was learning or when he was practicing, realized the Way because he served as a personal attendant to the master who had been practicing for a long time." In the course of attending to Master Gutei, he attained realization. By focusing on the activity of helping Master Gutei every day, the student was not aware he was being trained. He probably spent his time making the master's bed and fetching tea. Yet those activities, in accord with Master Gutei's instruction, created his passage from student to master. This transformation was due to the confluence of all the activities: all the befores and afters and the independent moments of the student's life with the master. His interactions with Master Gutei resulted in his total immersion in practice-realization. Transformation was always present, yet there was a particular moment of its recognition when Master Gutei acknowledged his passage into spiritual maturity. Just one flower being held up for display is passage through all time and being, awakening each and every thing. This is what Mahakasyapa realized. Essentially his realization was already present as his own being, yet it was the passage of all buddha-nature in and through him that revealed his true nature. This is our passage too. Dogen ends this paragraph with the admonition 'All of this you must give careful and repeated examination.' At each critical juncture of the text, Dogen reminds us to pay attention. We want to grapple with this teaching in such a way that it brings us back to our present situation. In particular, understanding passage is critical to conceptualizing how practice-realization is enacted. In this case, the story of Gutei's student is instructive. His awakening is the result of his complete immersion in the activity of his life, through the guidance of his teacher. His realization did not come about because of his preconceived idea about enlightenment. Of course, this book, Dogen's 'Uji', and all of Buddhist writings and teachings are a product of the mind and heart. We must use them as pointers along the path of practice. Deep understanding of Buddhism is always grounded in dharma teachings, dharma teachers, and dharma community. Guidance in practice happens within the context of connection with these three elements. Teachings, teachers, and community give us the forum to explore, actualize, and be confirmed in our understanding. In this way we are able to 'carefully explore the matter' of being-time's actualization in daily life, not in our heads. 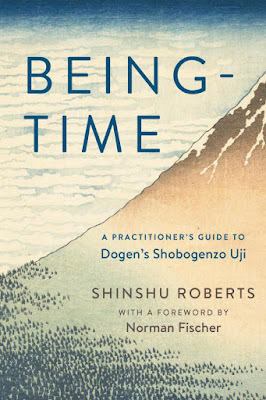 Before I began to write this book, I did not realize the immense scope of Dogen's vision of being-time. But no matter what I think I know about being-time, it is stopping and being in my being-time just as it is, enacting the no-self of my exertion with all being that is actualizing being-time. This is enacted in the context of my Buddhist practice community. It is actualized at the supermarket, while driving my car, or when walking the dog. Nothing other than living one's life completely in the Way is actualizing being-time's passage." On the great road of buddha ancestors there is always unsurpassable practice, continuous and sustained. It forms the circle of the way and is never cut off. Between aspiration, practice, enlightenment, and nirvana, there is not a moment's gap; continuous practice is the circle of the way." This 'mind' of or intention for 'immediate present ultimate Dharma' is things-as-they-are-ness, or being-time. When we find ourselves wishing that we could experience our life with equanimity, compassion, and wisdom, we are listening and connecting with what is already present within ourselves and all of life. This inmost request is an expression of each being's continuous practice-realization. Even when we feel most alone, we are still embedded in community. Even when we think our delusion cannot go deeper, we are accompanied by enlightenment. In each moment that we glean a small part of the totality of life, the whole is never missing. As Dogen Zenji says, 'But do not ask me where I'm going / As I travel in this limitless world / Where every step I take is my home.'" 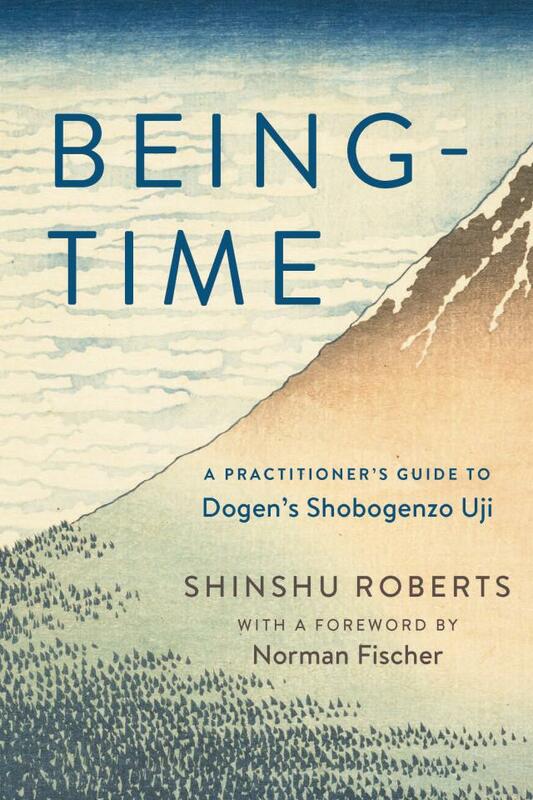 "'Uji' is one of Dogen's most revered and difficult texts. In it, he attempts to clearly elucidate the meaning of practice within the context of the totality of the world's expression. Reaching or not-reaching, blinking an eye, reciting the robe verse, driving to work, caring for a parent, or weeding the garden - in every activity, we transmit and receive the Buddhadharma. Everything recites the sutra of uji, in the midst of joy and gratitude, grief and pain. Heeding the words of Old Buddha Dogen, we have faith that nothing is missing; practice-realization is not apart from us." Although duality is a mind state, not all mind states are dualistic. In the absence of the sense of separation, the phenomen-ing of thought still arises. Just as there is feeling without a feeler, seeing without a see-er, thinking without a thinker arises. For it to be dualistic it requires a secondary layer of thought or belief that says it is 'my' thought. A clear 'seeing' that subject and object are always, always one (or indeed none), renders all this struggle unnecessary. All there can ever be is Oneness appearing as this ever-fresh self-shining display. The separation is the imposition - though admittedly a very compelling one. (1:16 PM) Thusness: Satellite yes. :) If this state is truly stabilized, DO must be understood intuitively. (11:25 PM) AEN: Okay, so, like, I just figured out where all the discussion about Consciousness with Satellite was going after watching a video of Kevin Edwards. In fact, I think something has been brewing here for a while and it may not be done yet. Basically, what I was trying to say in the discussion here is that mind automatically structures everything dualistically. That is, subject----verb----object, and yet in every case, the subject and object are assumed, leaving only the verb. If you hang in with me, I'll explain, and it looks pretty cool from here. We say Consciousness expresses in form, but is there really a Consciousness apart from that expression, or is Consciousness just a conceptual subject supplied by the mind so that it seems to come from somewhere? What if Consciousness is it's content, such that the expression is all there is to this Consciousness thingy? Also, is there really a form? Do we know that, or do we also assume the existence of the object? I'm saying there is no subject and there is no object, just the expression itself. Consciousness IS that expression. Lets take thought. We say The thinker thought a thought. Is there a thinker or a conceptual thing we call a thought, or is there just thinking arising. Is there really any more to it than that? The subject and object are assumed and have no reality at all. Lets take Awareness. We say Awareness is aware of a tree. The subject and object are assumed and there is just awareness itself. There is no Awareness anywhere. It's existence is literally inherent to it's being aware. There is no object to Awareness either, and so we might say that the tree is awareness happening, but in the absence of an object we call a tree. Listening to Kevin tonight, it came together for me when he said something like 'You say, "I see a plant". Now, throw away the point of reference, the I that sees.' In this, there is just the seeing of the plant without anybody seeing, and in fact the plant isn't even there, so there's just the seeing. No subject (me) and no object seen, just the perception iteself, inseparable from any other subject, and identical with all objects, because all subjects and all objects are literally the perceiving itself. In this way, everything is one thing, in the absence of thingness and in the absence of a separate perceiver. There is just experience happening. No experiencer and nothing experienced. If mind insists on retaining it's made up subject and object, then we can say the experiencer IS the experiencing itself, and the experiencing IS the experienced, and they all become one. With a touch less of the slightly metaphysical tone, this could be the work of a Mahayana Buddhist. In this sense, there is nothing - only happenings, only experiencing. (11:28 PM) AEN: Yet in order for apparent communication and interaction, experience is conceptually divided into parts. Right now, all there is is seamless experience. The phone rings - now it might be clumsy to say that the ring is an expression of experience - but it could be said that experience is arising as the sound of the phone. So now we have experience... arising as a something. We are not saying that experience is apart from the thing experienced... only that language/conceptual thought can make it look that way. (11:33 PM) AEN: u mean phroggy shld practice non-conceptuality? (1:24 AM) Thusness: What is the url? (1:35 AM) Thusness: There r different depth to this experience. (1:38 AM) Thusness: The Tendency to grasp this understanding conceptually will normally last for another few yrs or longer. (1:39 AM) AEN: btw phroggy realised anatta? (1:41 AM) AEN: conceptually thinking it? (1:41 AM) Thusness: But there must be direct experience. (1:41 AM) Thusness: Reminding oneself of this new found truth. (1:42 AM) AEN: but when he realised its not just a conceptual understand right? like he realised it? (1:44 AM) Thusness: But stage 6 is a lil different. (1:47 AM) Thusness: The next step is to see the DO (Dependent Origination) nature. (2:01 AM) Thusness: Future understanding is the dependently originate nature. (11:44 PM) Thusness: language brought about the delusion that there is a subject and object division. (11:45 PM) Thusness: actually it is not just language, attachment. (11:46 PM) Thusness: proggy must later move from 5 aggregates to 18 dhatus, eliminating the mental formation. (11:47 PM) Thusness: then she will find delight in DO. (10:01 PM) Thusness: actually Proggy wrote very well the post. (10:01 PM) Thusness: it is just that one experience. (10:01 PM) Thusness: however there are few more important points to take note after initial insight. (10:06 PM) Thusness: Actually if u understood what Satellite and Phroggy meant, u will realise that John Myrdhin, isn't there yet. (10:07 PM) Thusness: If there is just one Happening where subject and object are merely assumed, how can there be manifestation of the mind. (10:09 PM) Thusness: It was only when a practitioner is still assuming that there is a subject and object that such distinction exist. (10:10 PM) Thusness: otherwise it is just one expression, one body, one reality. (10:11 PM) Thusness: yet after this experience due to the 'tendency to divide', there will definitely be a period of desync. If a practitioner cannot pass the test, his experience will not be stabilized and liberation will not be experienced. (11:00 PM) Thusness: By the way it is because we are unable to see with complete clarity that appearance is awareness that 'practice' is necessary.